In the front row of a grandstand towering about the par-3 17th green at TPC Twin Cities, a man’s voice cut the silence that consumed a critical moment in the Greats of Golf competition Saturday during the second round of the PGA TOUR Champions’ 3M Championship outside Minneapolis. The foursome appropriately named “Team Greatest Ever” was tied with Team LPGA—Nancy Lopez, Pat Bradley, Michelle McGann and Captain Bill Rogers—standing on the 18th tee, listening to see what might happen on the 17th green. Team Greatest Ever faced a 15-foot birdie putt for the lead. Lee Trevino slid his putt by. So did Jerry Pate. Ditto for Gary Player. There was only one player left. Jack did. And the roars shook the grandstand. Reminiscent of a some reactions to iconic victories of decades past, the Golden Bear punched the sky in celebration. Then Trevino and Pate took turns hugging their partner. Player reached out a hand and then a pat on the back. Whether age 17 or 77, winning never gets old. Four men totaling a combined 298 years in age were again kids at heart. And when the foursome stepped on the 18th tee on Saturday afternoon, they had a new toy in the form of a one-shot lead. Behind the long-hitting Pate, three of the four reached the green in the two—all with makeable eagle putts. It was Pate’s 5-iron from about 185 yards that settled four feet from the pin for the easy eagle, a stunning 18-under finish in the scramble format, and a two-shot win in the popular Greats of Golf Competition. “We really enjoy these opportunities,” Nicklaus said. “We don’t get to see each other enough, and we look forward to this each and every year. If this were an event where the three of us had to come up here and keep our score, I don’t think any of us would be here. It was Nicklaus who did just that, starting on the back nine. After Jerry Pate’s 322-yard drive on No. 9—a blast that had him striking a pose reminiscent of the Incredible Hulk—left the team 62 yards out, the foursome recorded an easy birdie and made the turn 8-under. Nicklaus almost did, lipping out a wedge shot and settling for a kick-in birdie. “I love this,” Trevino said earlier in the day. “I can’t get enough of it. Jack, batting cleanup, saved his team on No. 12 with a critical birdie putt. Once the group got to No. 14, they learned Team Ryder Cup had stumbled, but the new threat was Team LPGA, which was 14-under through 14. But at 15, Team LPGA had to settle for par. A birdie by Team Greatest Ever put them even. Both teams birdied No. 16 to go to the par-3 149-yard 17th tied at 15-under. Watching from the tee box, Team Greatest Ever saw Team LPGA singe the edge of the cup four straight times, before settling for par. That served to set up the drama of 17 and the moment for Jack Nicklaus. 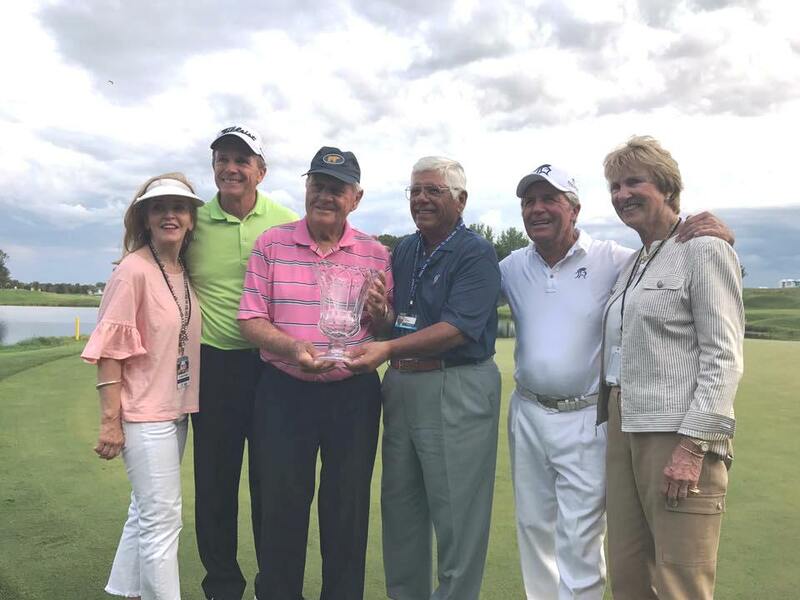 As Nancy Lopez’s husband-turned-caddie, Ed Russell, said, he wanted his wife and teammates to win, “but until today, I had never heard a Nicklaus roar.” For him, that was a nice consolation.